Where are the photos shown? What are the requirements for photos? Photos of the business are shown in Mobile Yandex.Maps. To see the photo, find the business on the map and go to the business profile. 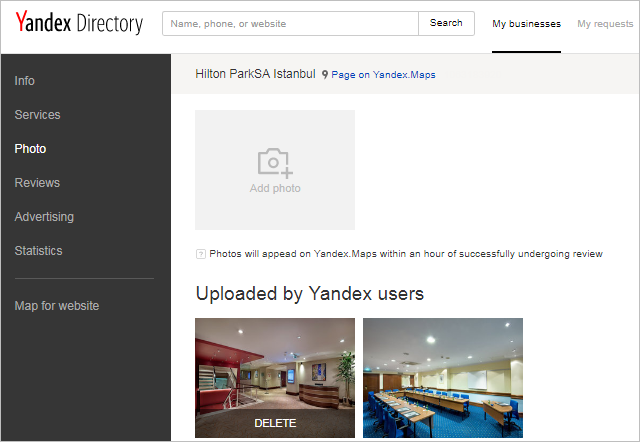 Only owners of the business can add photos through the Yandex Business Directory interface. Go to the Photo section and click Add photo. Files should be in JPEG or PNG format. Maximum file size is 10 MB, and the image size must be between 320×240 and 5000×5000 pixels. Are not related to the business. Are duplicates of ones previously added. Have low quality (for example, are dark or blurry). Have text that obstructs the picture. Have telephone numbers (except for cases when the number is on the organization's sign). Show narcotics, guns, medicine, or other items that are prohibited or restricted for sale. Contain information about offers or services that are illegal on the territory where the phots are shown. Contain information prohibited for dissemination by law, Yandex user agreements, or any other documents regulating the use of Yandex services. Violate intellectual property rights, including copyright, trademark, and brand name rights. Contain personal information of individuals or a secret protected by law, including photos of documents. Have shocking or provocative content, or contain scenes of violence and cruelty, slogans, or incitements. Show individual items (except for cases when a shop window with goods is present on the photo as a part of the interior and is not the main focus of the photo). Show portraits of people that do not give an idea of the organization's business or interior. Are not photos (the only exception is logos). Attention. Publication and/or dissemination of photos must conform to the Yandex user agreement. Go to the Photo section, choose the photo you want to stop showing, and click Delete. The photo will be removed within an hour. Where are the photos shown?How do I add photos?What are the requirements for photos?How do I remove a photo?